After all the pattern alterations that were made to Toile No. 1, in this post we’ll look at how they all sewed up in a fresh toile. This post will also cover some tweaks made to improve the make of the garment, including an invisible zip at the waist and a hem facing. This pattern is also being toiled to be used as part of our mini collection based around Mood Board No. 1. 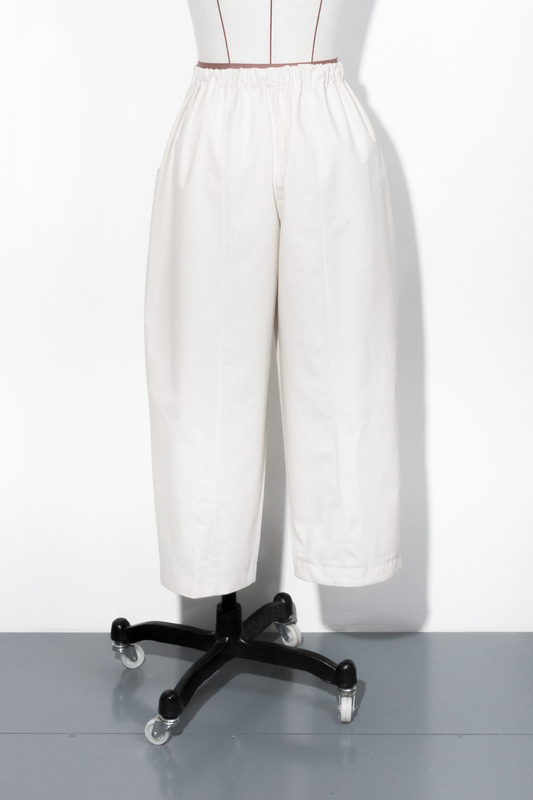 As a recap, these trousers were originally cut as a Size 10 V8499, in Version C (the longer length trousers) and sewn up to create Toile No.1. This size was chosen based on body measurements, but after the design came out quite generously sized, particularly through the hip area, we used pins to fit the garment to reduce volume. Although the first toile was cut as Version C, this extra length was mainly chosen to give us enough space in the toile so that we could crop the hem length as needed. 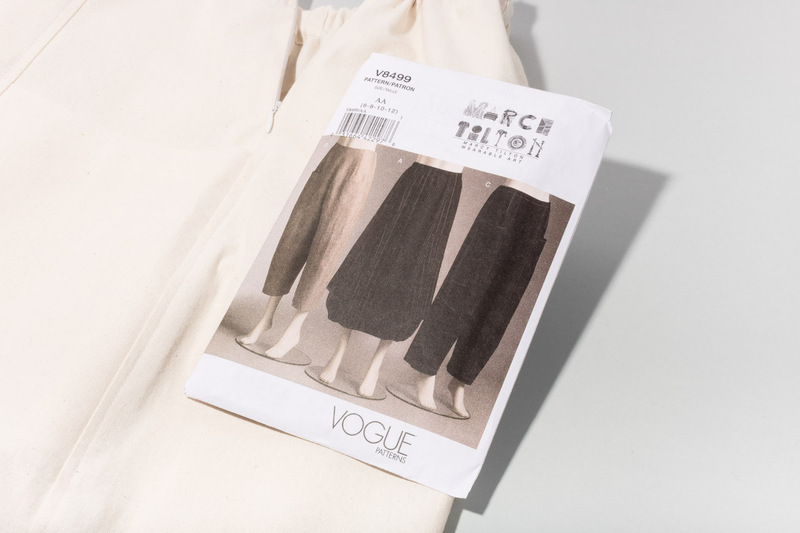 Ideally, we are aiming for a fit similar to the way Version B looks on the envelope – generous use of volume through the legs with the hem cropped to a nice length. In the images below, you can see how Toile No. 2 came out, where a more balanced fit has been achieved on the mannequin. For those of you that are familiar with the pattern, you will notice that we have added in an invisible zip at the side. This was needed as a result of the amount of volume that was removed in the hip area, which we will explain below. The pattern adjustments and make choices that you opt for when using this pattern will completely depend on your size and shape. And specifically on the ratio between your waist and hips. These measurements are specifically linked for this pattern because of the construction with the elasticated back waist. 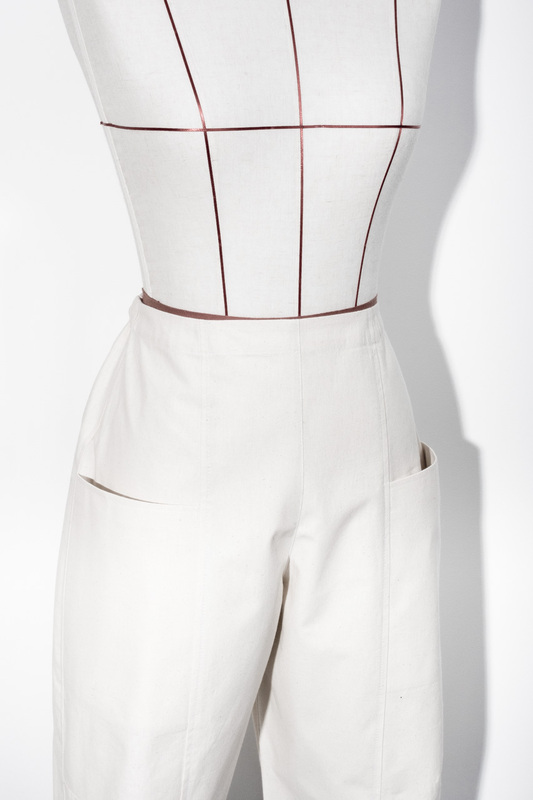 The idea is that the elasticated waist is a simple option. If you are a sewing beginner, it means that you don’t have to worry about putting in a zip or other closure. 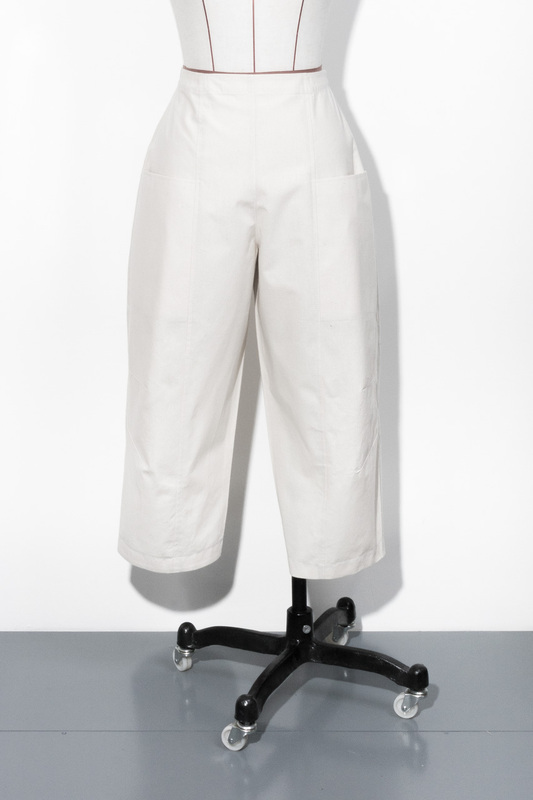 And it’s also quite comfortable as a feature of the style, allowing the fit of the trousers to be more forgiving. However, in practice what it means is that the waist measurement needs to be large enough so that you can pull the trousers up over your hips. 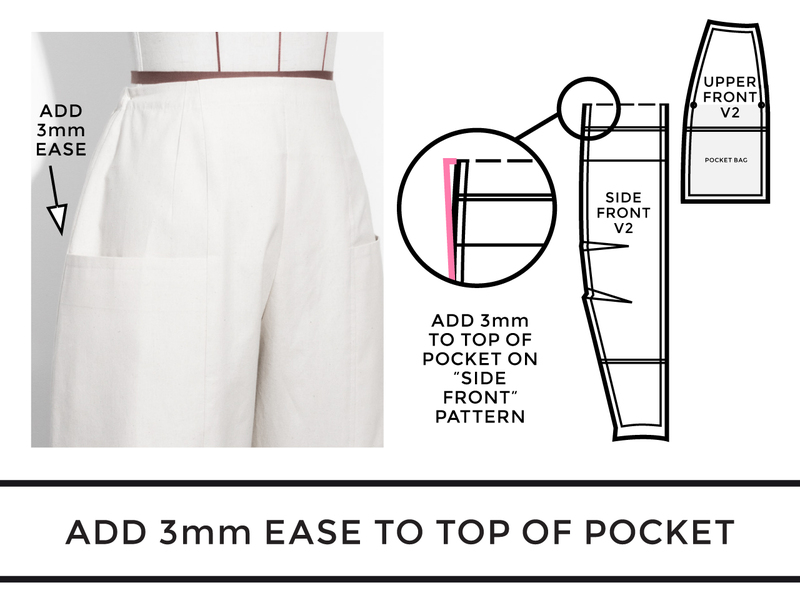 If you have reduced volume out of the front and back pattern pieces as we did, then your waist measurement may have narrowed so that it is now too small for you to pull the trousers over your hips. Even when the back elastic is stretched. By inserting an invisible zip into the left side seam, you can get the best of both worlds. You can fit the garment as you like, but you can also have the elastic waistband to make the trousers more comfortable to wear. 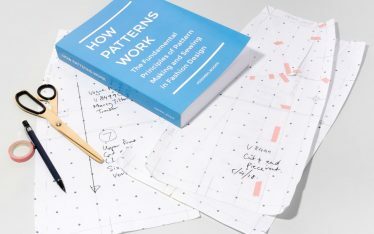 You can tell whether or not this will apply to your pattern alterations by measuring along the waist seamline of the pattern, and compare this to your hip body measurement. Remember not to include the seam allowance or any dart value. Therefore garment is at least 2cm too small for hips. Depending on your measurements you may be able to work around it when doing your pattern alterations and make compromises. Otherwise, you can insert an invisible zipper into the side seam, or add another type of closure. To sew the invisible zipper for this toile, we created a hybrid method using elements of the techniques in our book How To Start Sewing. The basic process for inserting the zipper was based on Exercise 45.15: Invisible Zipper Method 2. 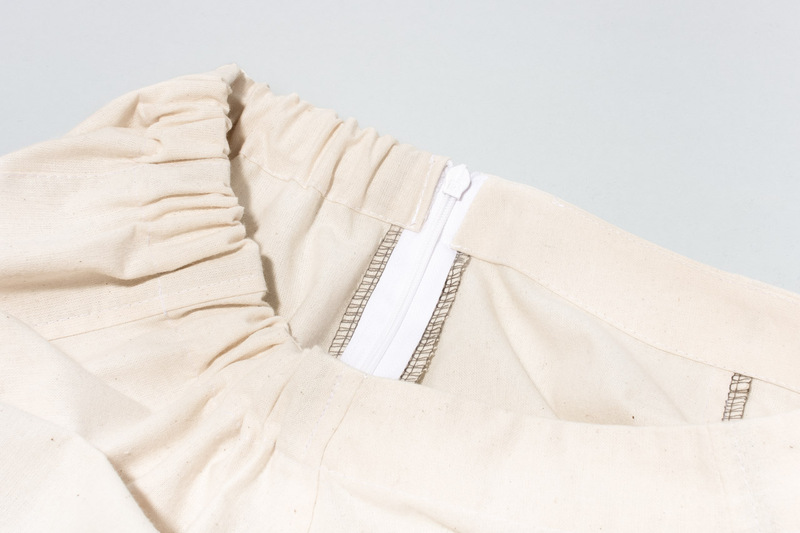 In this method, the side seam is sewn before the zip is inserted. The neat finish on the inside is created using the allowance for the folded back waistband, and the front facing. This method is similar to the way we applied a facing to a centred lapped zipper in How To Start Sewing (Exercise 45.19: Facing and Lining for a Centred Lapped Zipper). But with the added complication that we are leaving sections open to use as a casing for the back elastic. If you would be interested in seeing a more complete explanation of how we’ve brought these different skills together, then let us know in the comments. 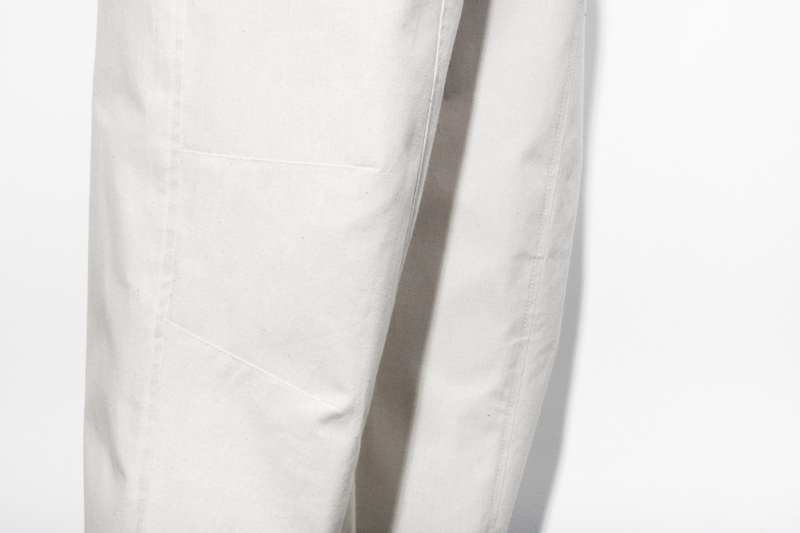 Due to the curved shape of the hem on these trousers, we experimented with two different options for finishes on this toile. 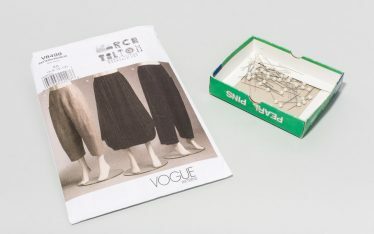 Both of the images below show the legs turned inside out so that you can view the finish on the inside of the trouser legs. On one leg, we overlocked the hem then clipped into the top of the hem allowance so that it could be pressed into the curved shape. This was with 3.5 cm hem allowance and topstitched at 3 cm. While this looked fine from the outside of the garment, the breaks on the inside of the hem obviously look quite messy, as you can see from the image above. While this method has the advantage of leaving you a little space for a hem adjustment later, it was ultimately better to switch this to a hem facing. You can see from this version, that the finish is much neater. In certain fabrics, this also gives you more control over providing support in this area. For example, you could block fuse this facing if needed. Or to prevent the edge from stretching you could use a fusible tape just along the hemline. You can just make out the line of stitching on this facing where it has been understitched so that it rolls towards the inside of the garment. 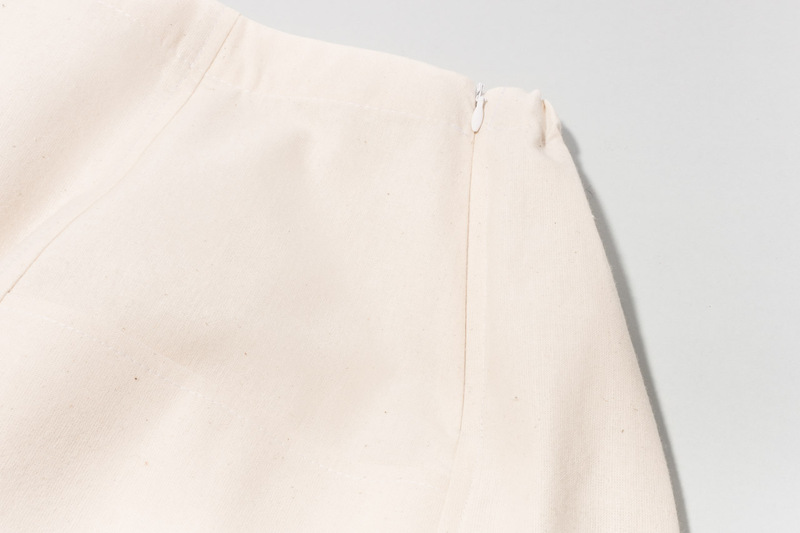 The pattern for the hem facing was created by temporarily taping all of the trouser leg pieces together (remember to exclude the seam allowances), and then the curved facing was traced off. The width of the hem facing is 3.5 cm. The top of the facing is finished with overlocking (without trimming). The seam allowance on the bottom hem edge only needs to be 6 mm. The bottom of the trouser leg pattern will need to be updated to match the 6 mm SA. 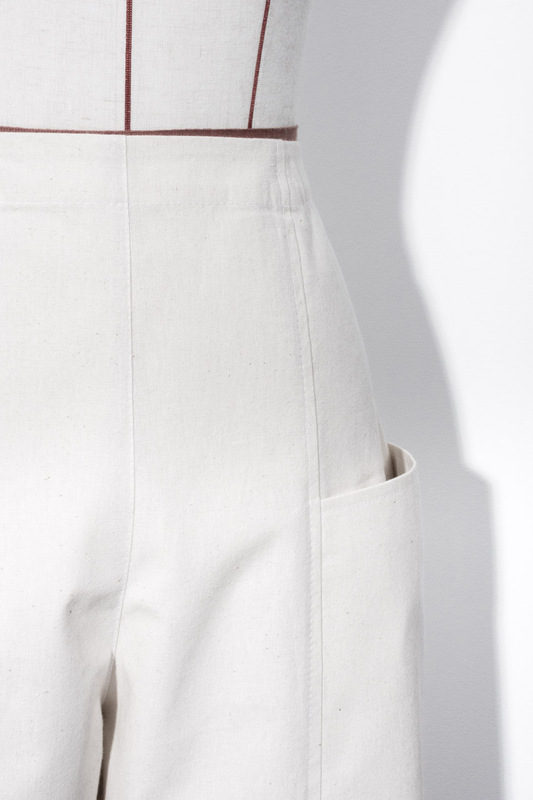 The seam for the facing matches the inner seam on the leg of the trousers. The facing will be topstitched into place at a width of 3 cm. There was one pattern alteration that was described briefly in the last blog post, but it is easier to explain the change next to the images of the toile. On Toile No. 1 the top of the pocket was slightly compressing the fabric underneath, so we made a slight alteration to the pattern for Toile No. 2 to fix that. By adding an extra 3 mm to the outside edge of the “Side Front” pattern it creates just enough extra space so that the pocket will curve more nicely over the underlayer. In the photos below, Toile No. 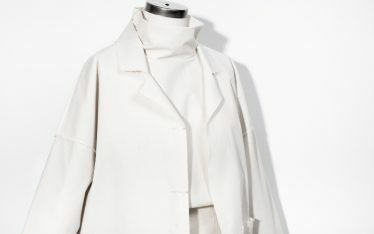 2 has been positioned to emphasise the way that the pockets sit out slightly now that just a little ease has been added. 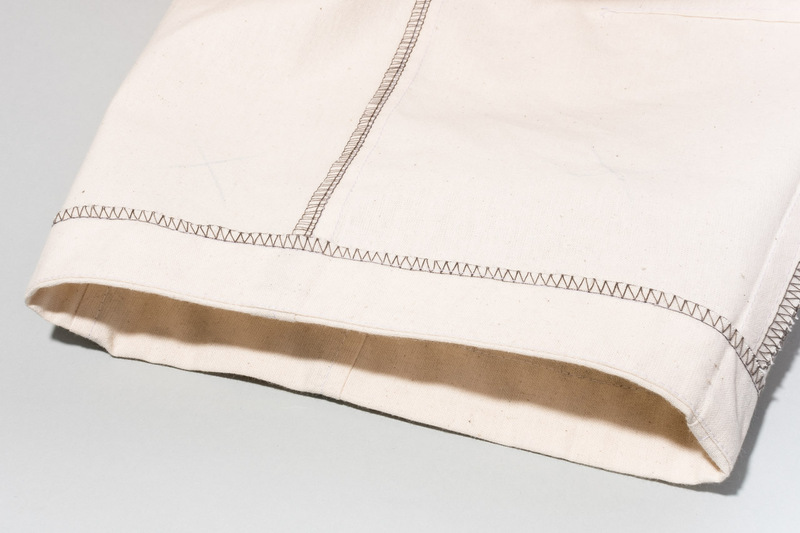 An extra line of stitching was used to hold the outer and under layers of the pocket in position before the side seam was sewn. One of the main things to be aware of with all of these changes is how they also affect the order that the garment is constructed. This is particularly affected by the decision to include a contrast topstitching detail on the final garment, and because we’ve added an invisible zipper. 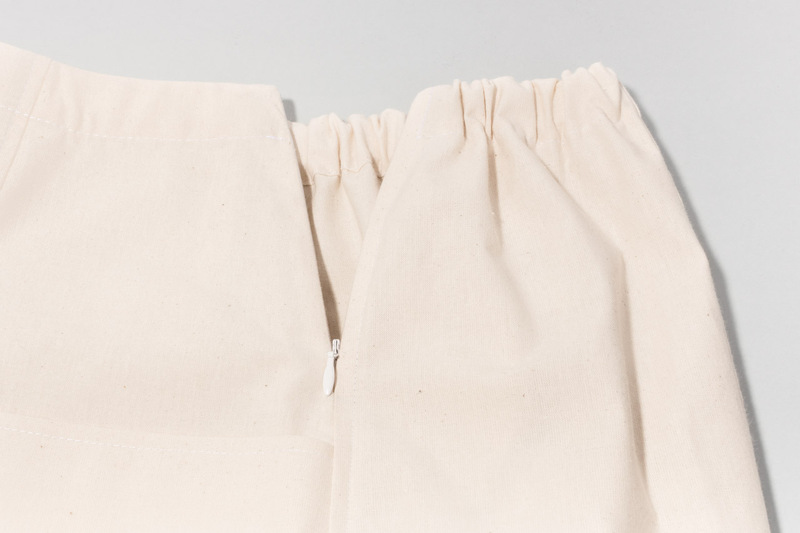 For example, the decision to put in the invisible zipper changed the order of when we would need to sew the side seam, which also has made it more difficult to sew the topstitching up the side seams. This is just something to be aware of when making your own changes to this pattern, and it may help to think the process through before you start and make note of what you will sew when. This may also help you to group similar processes together, rather than jumping between different machines, or constantly switching threads. 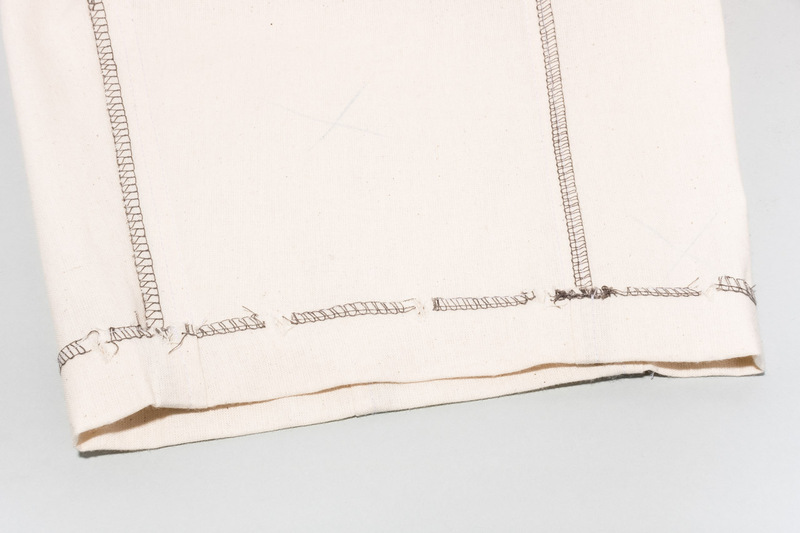 In general, you will want to sew the topstitching on each seam before it is crossed by another panel. For example, this will apply to the topstitching that runs across the top of the pocket. You may also want to consider which seams to overlock open or closed. 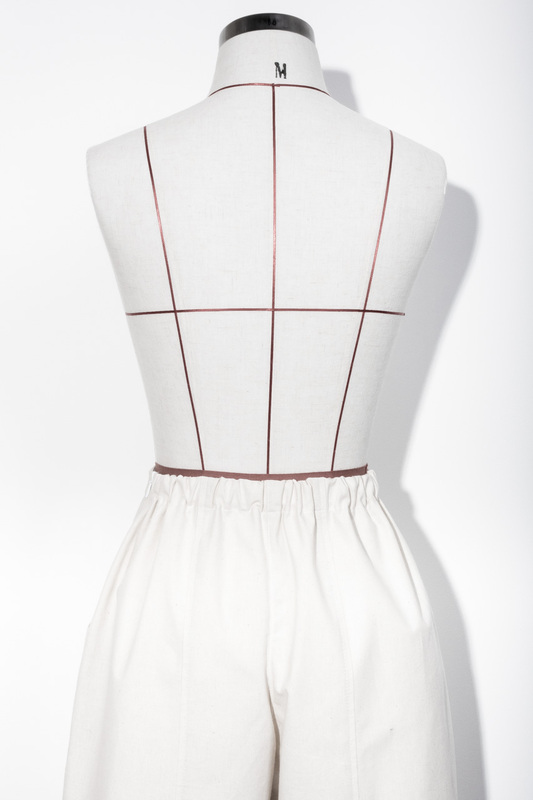 On this toile, all seams were overlocked closed where possible, but each edge of the fabric was overlocked separately on the side seam before the invisible zipper was inserted to allow for a neat finish. Invisible zip inserted in the left side seam. Hems finished with hem facings. Top of pocket has 3 mm ease added relative to the underlayer. Raw edges of seams finished with overlocking. Crotch and inner leg seams were edgestitched to hold SA down. Possibly only edgestitch the inner leg seam on the final garment as the crotch seam seems to be causing puckers. 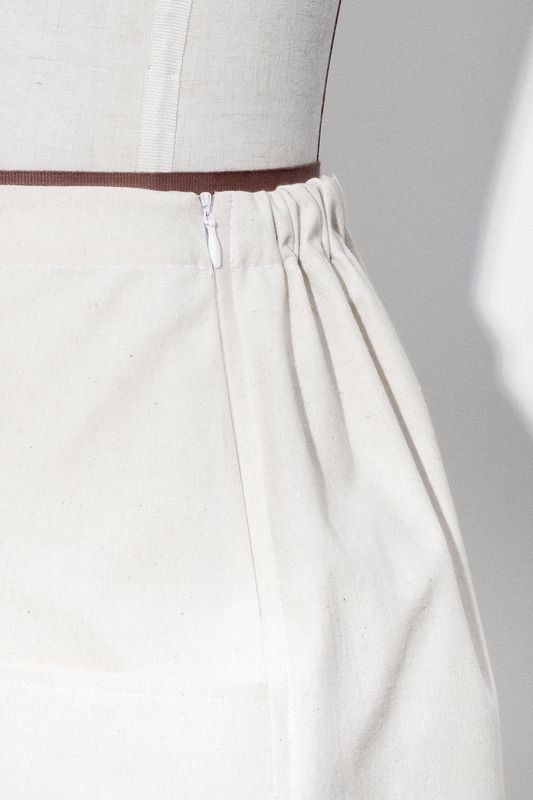 Keep slightly more length in the hem for a cropped leg length at a better proportion. Once final hem length has been set, retrace the hem facing. Add about 8 mm extra to the width of the back casing on the pattern, with the SA at 1 cm. This is needed to allow enough fabric to fold over the front facing for a neat finish on the inside of the garment, particularly because the front and back pieces of the garment meet at an angle at the side seam.